With the popularity of adventure motorcycles going on for more than a decade already, it seemed natural for Honda to bring its discontinued but always popular Africa Twin back to the market. However, for many years already Honda has ignored the pleas of adventure riders and fans worldwide who were asking for the return of the Africa Twin, a true 50/50 (on road and off-pavement) adventure motorcycle from Honda. Instead Honda seemed to go the other way, developing adventure styled motorcycles that were increasingly more road biased. That was until early in 2013 when rumors of an actual Honda adventure motorcycle appeared, coming from sources with direct connections with Honda. During the 2013 EICMA show in Milan Honda’s head of product planning (Dave Hancock) on an interview with Moto.IT stoked the fire providing a strong hint that something especial would be coming up from Honda in the adventure department. 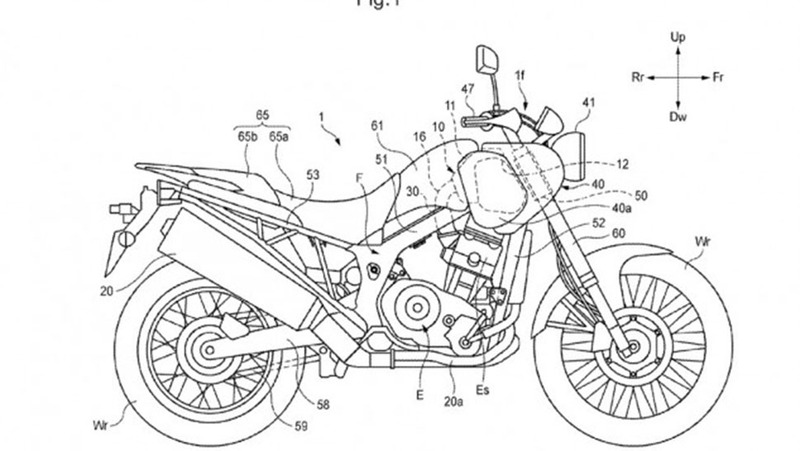 During this time, Honda submitted several patents related to what appeared to be an adventure motorcycle. A review of several of these patents indicated Honda was going in, and doing so in with style, with a motorcycle which incorporated several new ideas. More on that later. In the fall of 2014 an adventure motorcycle from Honda, at a high level of development was presented to the public during the 2014 EICMA show in Milan under the True Adventure banner. 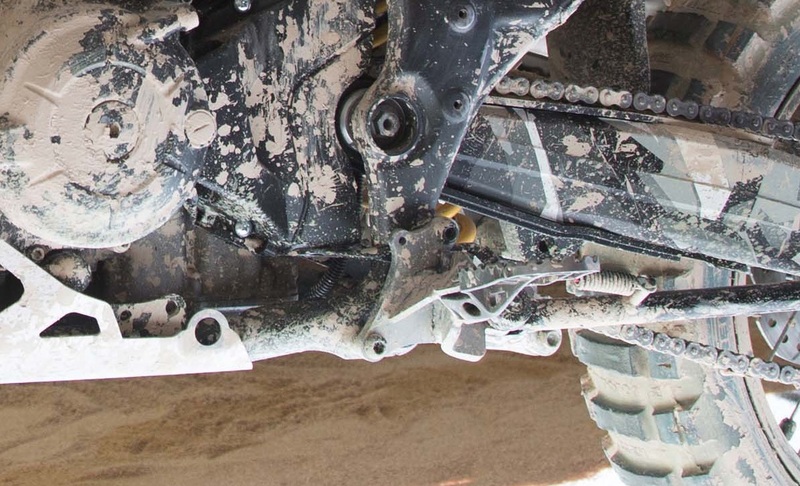 The motorcycle was disguised with what seemed to be fake mud, but showed wear and tear on certain components indicating it had actually been ridden. We believe this is the motorcycle that matches the above rumored specs (except for the 18inch real wheel of the displayed bike – instead of the 17 inch wheels on the rumored specs). We also believe this motorcycle is one of the bikes that had been tested in the Winter and Spring of 2014. 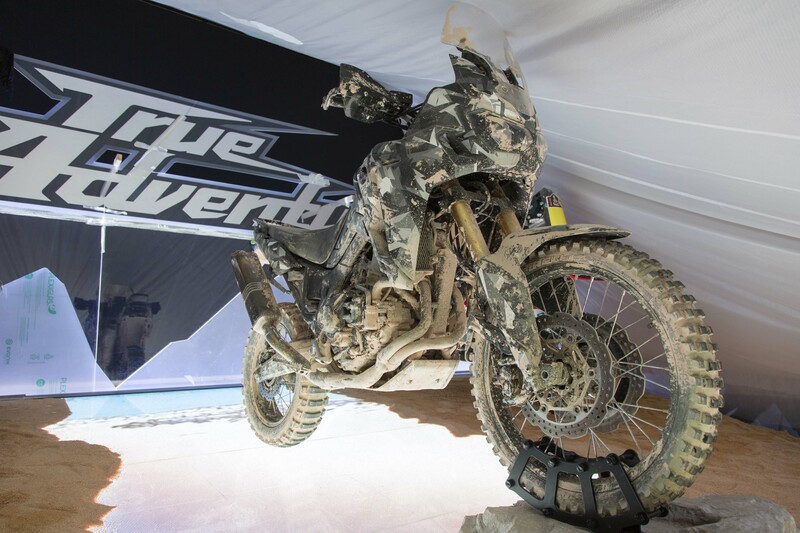 One other important item about this “True Adventure” bike presented at the EICMA show, which was noticed from observing the bike itself, was the absence of a clutch lever and gear shift pedal. It was confirmed by Honda officials at that time that this bike would have the option of a Dual Clutch Transmission (DCT). This has been a long but steady road about the development of this bike. Somehow, Honda kept us informed along the way with just the right amount of information for us to picture in our minds what they were planning to do about this bike. A good and probably inexpensive marketing campaign so far. The story about this bike continues on a series of videos released by Honda as part of its marketing campaign on this motorcycle. Episode 4 video was launched by Honda last week. On this episode, the video depicts a meeting with the True Adventure motorcycle project management, the bike’s engineers, the test riders, and again, there was Dave Hancock, Honda’s head of product planning. The video shows the team gathered around a table to talk about the bike, a day after the test riders had taken it out for a test ride. Based on their conversation, the bike they are discussing in the video is clearly an evolution of the bike they rode in the Spring of 2014, that is (in our opinion), an evolution of the bike presented at EICMA. The test riders discuss their impressions when the see the bike again one year later. They describe a few characteristics of the motorcycle, talk about improvements from the previous version, and leave us wondering about what is going to be depicted in the next episode by showing clips of the bike in action as a teaser for the Part 2 of this meeting. Yesterday we tested the adventure bike which is going to change the face of the adventure world forever. He could be referring to the many innovative items this bike will present as demonstrated by the long list of patents Honda has secured for this motorcycle. One such item is the position of the air cleaner on this bike. By splitting it into two halves and placing them on the sides of the tank, it allows them to be higher and farther from the ground, while the heavier gasoline can be placed lower, directly on top of the motor, and perhaps partially under the seat, allowing for a lower center of gravity. He could also be referring to the Dual Clutch Transmission. This type of transmission has existed in cars for many years already. And in the last few years Honda has introduced it to motorcycles (NC700 and NC750, and other models as well). Therefore DCTs are nothing new. What is new is an application of a DCT transmission on adventure motorcycles. If it does succeed, this motorcycle will really change the adventure world forever. Although we have already been exposed to something similar for adventure bikes – such as the Rekluse auto-clutch, the DCT offers a new window of opportunities, as it becomes an intrinsic system, core to the operation of the motorcycle. The DCT is a very important element about this bike, but it is one of many innovations this motorcycle will bring to the adventure world. As we mentioned before, the list of patents submitted by Honda during the development of this bike is large, here we just covered the air cleaners solution Honda proposes with this bike. Dave Hancock may not be exaggerating when he says this bike will change the face of the adventure world forever. Is the bike ready for prime time? All we have at this point are assumptions based on what we know about motorcycles in general, a few rumors here and there, and mostly the information Honda has officially provided to the public in these two last years. Among the official set of information from Honda is what we gathered from the Episode 4 video, where Honda officials state the bike has been worked on, improvements have been achieved from the previous iteration, and the head of product planning (Dave Hancock) appears confident about the bike. We will certainly hear more about the bike on the next video (which will likely be called “Episode 5 – The Meeting Part 2”). The latest time we expect to see this bike in production form is November 19-22 in Milan at the 2015 EICMA. We would not be surprised if this bike shows up before that event, though. It is only a hunch but we believe this bike is almost ready for prime time and at a minimum we will see a pre-production version very soon. This entry was posted in Bike Reviews and tagged crf1000, Honda CRF 1000, Honda True Adventure, honda's new adventure, New Africa Twin, True Adventure. Bookmark the permalink. It’ll be interesting to see what comes of this, particularly how the other adventure bike manufacturers respond. Though, I still think 1,000cc is too big for a RTW bike, and there’s already so much competition in this space, so it’s surprising Honda isn’t trying to fill the gap no other manufacturer is currently occupying: the mid-weight adventure bike category. Apparently, Honda thinks there’s more money to be made by taking on the heavy bikes. Three things… One: when you look at how many motorcycle models are available in the 1,200cc category, you realize that’s where the public is spending their money. There are more models in that large segment than any other segment within the group of Adventure motorcycles – BMW R1200GS being the top seller. Two, Manufacturers make more money, per unit, on bikes with higher price points. Three, having said all of that, it depends on what is your take on what is a midsize bike. What do you consider a midsize bike? The Honda, per speculated information, should be lighter than the current set of midsize adventure bikes (800XC and F800GS). If you see midsize as the 650cc singles, than it will depend on which model you will be using as a reference point. the Honda should be heavier than the water-cooled ones (Tenere 660), but not by too much. The question is, would the large displacement market be smaller if manufacturers actually provided a proper smaller-displacement alternative? Since there currently isn’t a great alternative, we just don’t know. People are buying big adventure bikes because that’s what the marketing implies is ideal, and because there’s nothing worthwhile available in the smaller sizes. Your second point is dead-on: dealers push the larger-displacement bikes because those bikes earn more. It’s unfortunate, and why a lot of people end up with too much bike for actually doing things off-pavement. I’m with Noah Horak (http://expeditionportal.com/an-open-letter-to-the-motorcycle-industry/) and Walter Colebach (http://www.sibirskyextreme.com/2013/08/bike-selection-101/) on the idea of a mid-size adventure bike being less than 165kg/363lbs. An updated, adventurized BMW G650X or KTM 690 would fit the bill, but neither exists. The best alternative is a KTM 690 R with aftermarket rally upgrades, but those kinds of farkles quickly bring the bike into 20k territory. If a manufacturer did it, the price would certainly be lower. Sadly, no one is doing this, despite the fact that bikes like the 690 R are difficult to get, and regularly see crazy RTW upgrades. There’s just no way the Africa Twin will be able to compete against single-cylinder bikes as far as weight goes. Maybe there’s an argument the DCT and other improvements will make the bike easier to ride off-road, to somewhat make up for the extra weight – I hope so, but I’m doubtful. Great points. It is really difficult to gauge what is the ideal RTW bike for everyone. Everyone sees it differently. The other day I was at the shop and was talking to a veteran traveler who was planning his second RTW trip. He was planning on getting an R1200GSA. Puzzled, I asked him why such a large bike, his answer: comfort, wind protection. Not all RTW trips and riders are the same. I can see the large BMW being a great advantage in the windy Patagonia desert. Of course, it would be a disaster in the road of bones. Or how about putting it on a boat somewhere to cross a river? Obvious it limits choice but his RTW does not involve boat rides, I would say. Anyway, there are plenty of options out there, including the DR650 for those who see simplicity as the way to go. And that is the choice of the majority of world travelers. Like you, I’m hopeful the Honda TA will do the trick, but for different reasons. I’m not interested in bikes that are too light. My Tiger 800XC is already a good size, in my opinion, but it is more of a road bike. I have a feeling the Honda will be a better all around mid-size (my kind of midsize) adventure bike. Meanwhile, it is great to have plenty of choices.